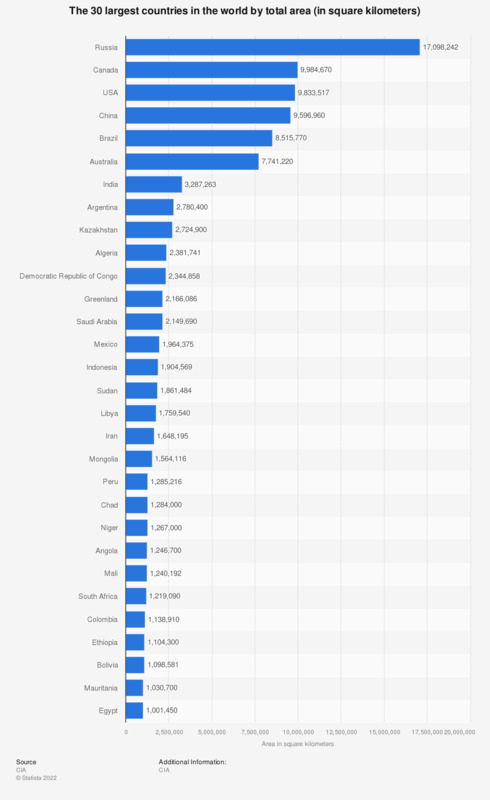 The statistic shows the 30 largest countries in the world by area. Russia is the largest country by far, with a total area of about 17 million square kilometers. Despite its large area, Russia - nowadays the largest country in the world - has a relatively small total population. However, its population is still rather large in numbers in comparison to those of other countries. In mid-2014, it was ranked ninth on a list of countries with the largest population, a ranking led by China with a population of over 1.37 billion people. In 2015, the estimated total population of Russia amounted to around 146 million people. The aforementioned low population density in Russia is a result of its vast landmass; in 2014, there were only around 8.78 inhabitants per square kilometer living in the country. Most of the Russian population lives in the nation’s capital and largest city, Moscow: In 2015, over 12 million people lived in the metropolis. According to the source, countries for which there is no information are not included. According to the source, area compares the sum of all land and water areas delimited by international boundaries and/or coastlines.